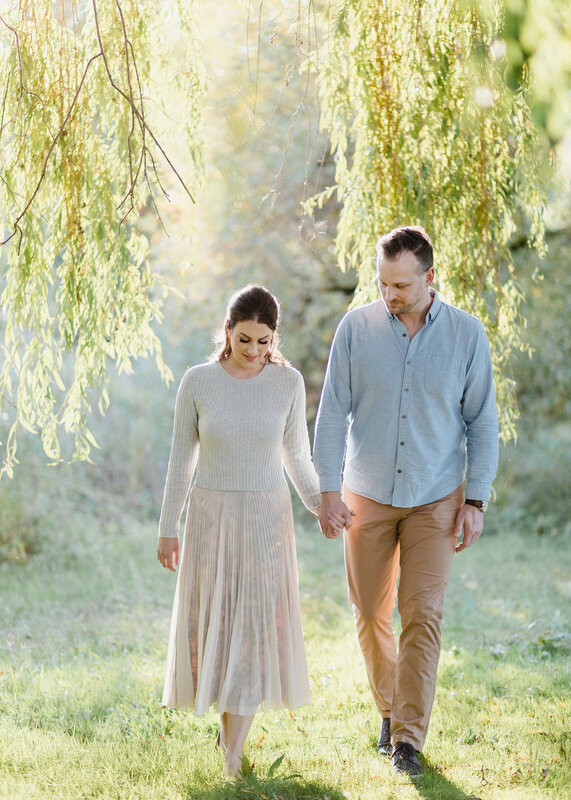 We believe that an engagement session is key to really allow us to connect with you as a couple, to document your journey from engagement to wedding. Creating a joyful, romantic and authentic atmosphere in order to better prepare you for your wedding day. We have found over the years that giving you time in front of our cameras before the big day makes you more at ease and much more confident. Allowing for more natural images. The experience you gain from your engagement session will make your wedding day feel seamless and enjoyable. We have created this Engagement Session Style Guide with you in mind. It is packed full to the brim of our best tips for getting the most out of your engagement session with us. Follow the advice detailed below and you’ll be sure will have beautiful portraits that are fresh and intimate, but also represent you as a couple. We love nothing more than interesting and of course romantic locations to shoot in. But we also know the logistics of what creates a good setting, too. Here are a few things to note. Hera’s preferred lighting conditions are overcast days, before sunrise, golden hour, sunset, and twilight. Open areas such as beaches and fields can create difficult lighting during the day (especially around midday.) Not only will we be dealing with blinding brightness causing squinting, direct sunlight usually causes skin to render very poorly on camera. To avoid harsh lighting as much as possible, it is suggested that all sessions takes place during overcast days, or time frames where the sun isn’t directly overhead. Of course, the weather is unpredictable, and we will do our best to accommodate. But note that if it is an overly sunny day, this would be the reason why we decide to shoot in the shade, which may in turn mean a different backdrop than we had first anticipated. For sunset photos, the portrait session will begin approximately two hours before the scheduled sunset during “the golden hour.” Remember, the sun sets much earlier during the colder months and much later during the warmer months, so make sure to factor that in when choosing your portrait session date, especially if you’re taking time off work or have evening plans afterward. A good location should offer shade and or covered areas in case of sudden weather changes. Having protected areas to avoid these situations will create a much more flattering look on the skin, but also allow more flexibility within the shoot, too. The location should offer a variety of backdrops in close proximity with furniture or items to interact with. This creates a more natural and candid feel. If you have a special location in mind, let us know ahead of time so we can plan a location scout to ensure it will photograph well. Please note that some locations may be unavailable due to permits. If you need some inspiration for finding a location, we have prepared a “preferred shoot locations” page which includes some of the best and most versatile places we have shot over the years. This can be found at the bottom of this guide. For an editorial look, we suggest bringing a little extra something with you to use for props. A freshly-picked bouquet for you to hold, or picnic basket and blanket. We find this is a fun way to bring a little extra romance to everyday objects. Whether it’s larger items like a bicycle or something as small as accessories; hats, scarves. Incorporating even just one extra styled item, could be a fun way to make your session more unique. Alternatively, pick a location that you can interact with the surroundings, such as an intimate table at a cafe to share a cup of coffee. If accessories aren’t your thing, don’t force it. However, if you do love a little sparkle, make sure to include it. Fun jewelry and scarves make great additions to your photos. And yes, we encourage to bring your furry companions with you as well. Every personal touch has the potential to tell more of your story. Have you thought about rocking a romantic gown, tulle skirt or flower crown but just never had an occasion for it? This is your chance to shine! Remember: There is no such thing as “too dressed up” when it comes to your engagement session, so don’t be afraid to have some fun! When choosing colours for your outfits, we recommend selecting lighter tones and more muted shades. By avoiding ultra-bright, bold colours, it takes away any distraction and will help lead the eye to your faces as opposed to your clothes; enabling us to better focus on and represent the way you feel about each other. The camera loves shades of soft pink and blue, mixed with sophisticated light, neutral colours like heather grey, creams, leather brown and white. The softer colour palette fits beautifully into almost all natural outdoor environments. Professional hair and makeup for your engagement shoot is on top of most of our brides’ to be lists. This is the perfect opportunity to have your trial with your own makeup artist that you’ll have on your wedding day! It removes the stress of getting ready on your own, you can be rest assured you look will fantastic. Most of our brides feel like their makeup is “too much” at first, since it’s more than you would wear on a normal day, so if you feel this way at the beginning, don’t worry! Good makeup artists know how to get it just right for the camera. Whether it’s lash extensions or blown-out hair, it can give you an extra boost of confidence in front of the camera, and it always photographs like a dream. Dresses and skirts tend to look most beautiful because they really flatter the female body. Long, flowy dresses and skirts look fantastic on camera because they bring extra movement to the photos. Especially when juxtaposed with nature. Cute, shorter-length dresses photograph beautifully, too. 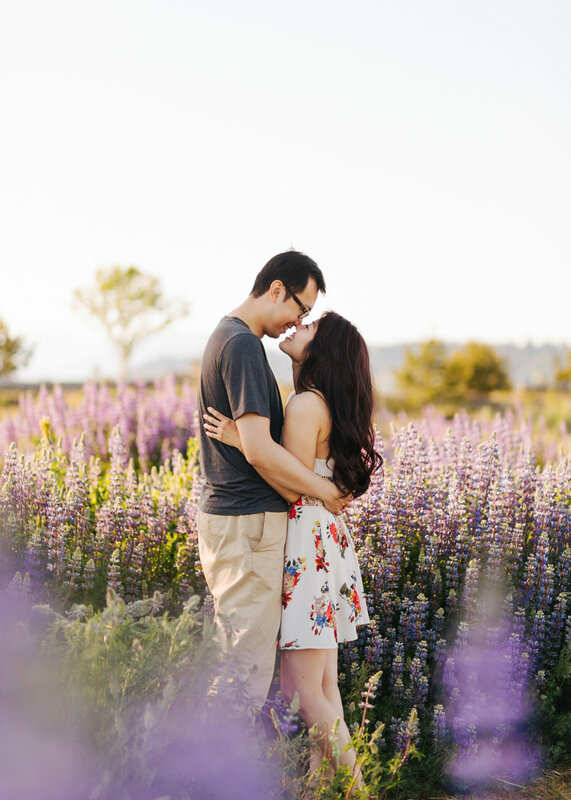 We recommend avoiding pants and shorts for your session, and saying yes to a dress or two. Q: Can I change my outfit during the shoot? A: Yes. Although we do encourage a maximum of two outfit changes during the shoot due to limited time constraints. Please also make a note before choosing locations that there is a convenient and close by place to change. Q: Can we bring our dog to the shoot? A: We allow dogs on engagement shoots if prior notice is given so we can plan accordingly. You must make sure your dog is well behaved and trained. Animals can be temperamental and may delay or disrupt the shoot. Q: Can I change my plans for the shoot? A: Any special requests must be made prior to shooting. Please allow no less than two weeks before to enquire about changes. Q: What happens if the weather is really bad on the day of shooting? A: It is recommended that you check weather conditions prior to choosing a time and date. (Please see Choosing your time and date above.) As stated, any changes to plans for your shoot, including location must be made prior to shooting. Of course, weather is unpredictable, and we will do our best to accommodate. But make sure to choose a location with a sheltered area in case of this happening. Alternatively, you may have the option to shoot in our studio if you book within due time. Q: Can I wear heels? A: Sure! Though please note, if you choose to wear heels, we recommend bringing an extra pair of shoes that are comfortable and easy to walk in whilst moving between locations. Q: Do I have to wear a dress? A: We want your images to leave you feeling beautiful! So we encourage you to step a little out of your comfort zone and embrace your beauty. We also want the images to represent you and for you to be comfortable. If you really do not wish to wear a dress, feel free to wear a more formal, flowy blouse. Something that is still elegant and leaves you feeling empowered. Q: Can we suggest poses or ideas when shooting? A: Hera have been providing photography services for over ten years, be rest assured we will compose the best possible images for you. We respect and understand you may have particular ideas in mind, but we only have a limited amount of time whilst on location. If you have specific ideas in mind, feel free to let us know prior whilst we work together to create plans for your shoot. We will happily add your ideas into the schedule.